Bouges was originally a rural manor house with a fortified château. 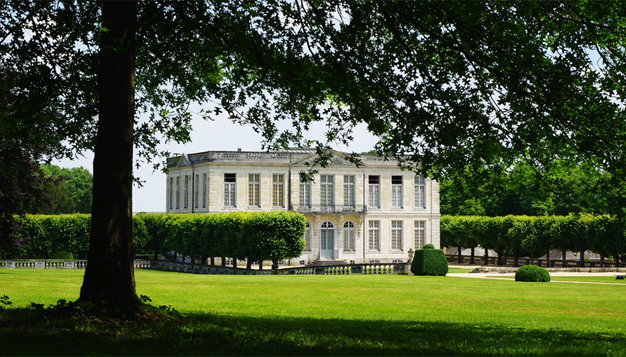 In 1759, Claude Charles François Leblanc de Marnaval, Louis XV’s general tax collector, purchased the land and soon replaced the old château with an elegant “Italian style” construction. The new, fashionable building was a demonstration of the ambition of its rich ironmaster, who had managed to make his name in the Parisian finance world and had recently gained a noble title (through marriage). His lifestyle was the subject of both astonishment and jealousy. Some 12 years later, he found himself bankrupt and his château was repossessed and sold. During the 19th century, the site passed through a number of owners, including the Prince of Talleyrand. The majority of the transformation work on the château was conducted by Henry Viguier, the director of a large Parisian store, and his wife Renée, from a rich family of drapers. They revived the property by installing stunning pieces of furniture, in harmony with the surroundings. They also modernised the château by introducing electricity, heating and running water. The purchase of Bouges gave Henry Viguier a chance to devote himself to his love of equestrianism, and he used his horses for every aspect of his daily activities (hunting, horse-riding, picnics, travel and purchasing supplies). He owned a stable of racehorses, and was particularly fond of attractive horse-drawn carriages. The stables, saddleries and carriage hall provide a particularly good representation of this passion. Renée Viguier, meanwhile, was passionate about flowers, and this recurring motif can be seen throughout the interior décor of the château. The couple transformed the existing vegetable garden into a flower garden (the “jardin bouquetier”), and exotic plants were installed in the large greenhouse. They also restored the plants and landscapes in the English and French formal gardens created by the Duchênes under the previous ownership. In 1967, with no descendants, the couple left the estate and its collection to the Caisse nationale des monuments historiques et des sites (now the Centre des Monuments Nationaux). Henry Viguier’s express wish was that the estate should be open to the public, and that the income generated should be used to maintain and restore the property.